Tip Trey - Visual card magic at it's best! Inspired by Karell Fox and Gaeton Bloom, this is one of the most amazing and easy card supsensions you will ever see. Homing Tie - At the end of a marathon card routine, a signed selection becomes part of your wardrobe. Smells Like Aces - The four aces exploded into reality. You wouldn't think that things like this were possible with a deck of cards. 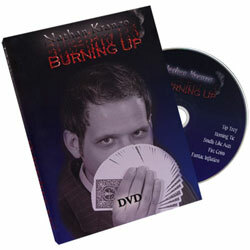 Fire Coins - This one is worth twice the asking price of the DVD! Silver Dollars appear one at a time with each strike of a match. You'll have to watch to see what happens next! Funtac Inflation - You will freak when you see a penny visually grow 100 times its original size! Then you will laugh when you see the easy method.